The pictured flower is Blanketflower (Gaillardia) a member of the Sunflower Family (Asteraceae), arguably the World’s largest family of flowering plants. A close inspection will reveal that the bee is liberally dusted with pollen; bee pollination is critical for seed production in Blanketflower as well as many other members of the Sunflower Family. Blanketflower is widespread in the United States , and ethnographic uses have been documented for various species. 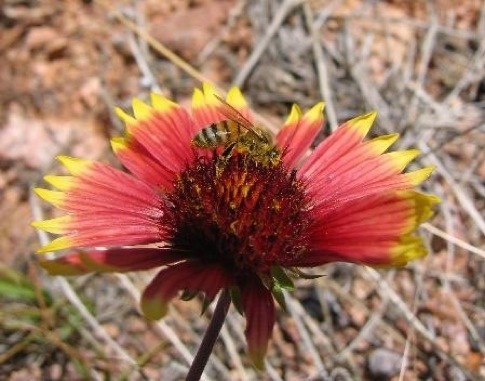 The Blackfoot, for example, used common blanketflower as a gastrointestinal and dermatological aid, as well as for an eye wash and to sooth sores derived from breastfeeding.